I think he saw it way more than .5 seconds before he hit the pole, and that's my entire point. And it's the point of the conversation in the other thread because you said you don't even pay attention to that part of the game. No, you associate the fact that because I choose not to watch it I immediately must not have any knowledge of what is going on. And then I must also not know how rough the game of basketball really is because I apparently have no idea what I'm talking about. Well guess what, this is hockey. As a player, I can tell you that there's no way Chara saw that for more than a split second. And there's no way he simply didn't care so he just drove Parcioretty into the boards. That's hockey. Your mind almost assumes there are boards to hit the player into when you're chasing hard with your eyes dead set on the puck/player. Well, in my first hockey game, I got to see a fight, a terrible call by the ref that ended up costing the Wolves the game, overtime, and a shoot-out that went into sudden death. It was a fine time. Hockey definitely is even more awesome in person. Especially towards the end of the game. Even college and high school hockey are fun live. Kudos on your first experience. Colin Campbell is very unbiased, and at the very most biased against Campbell. The problem is not any kind of bias on Colin Campbell's part. The problem is that the NHL hands out wildly uneven and inconsistent supplementary discipline that makes it look bush league, to be honest. I'm probably not the only one that thinks that the design itself in that area is screwed up. They should look into some super flexiglass, or perhaps a flat 45 degree board. I was going to mention that it seems odd that they can't have the edge taper up somehow. I have seen refs run into that spot, too, usually while dodging players, but certainly not so hard as that hit. It's not the only arena that has this area, by the way. I noticed that St.Louis has it, too, the other night when I watched the game. Don't all/most rinks have that design? 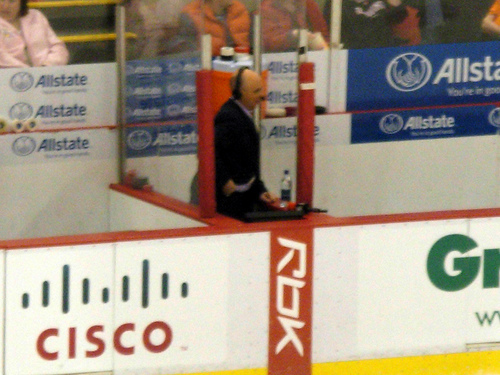 It's where Pierre McGuire sits. All they have to do is smooth out the corner and have the board angle into the bench. Really shouldn't be that hard to modify. well we can't get rid of it then! Where will Pierre McGuire sit?!! I heard McGuire mention that some arenas have that area, but with no glass and thus no need for the poles. It's all of the arenas (or almost all of, it actually surprises me if there is one without it). On both sides of the bench, it's dangerous. Well either way you have one on the other end of the bench. Not only should they angle it to lessen a blow, they should use a different material that takes a bit more shock. It's not like this is the first time a player has been in that situation. Just probably one of the worst case scenarios.